The five boys who came to illustrate the class divide of pre-war Britain, 1937. 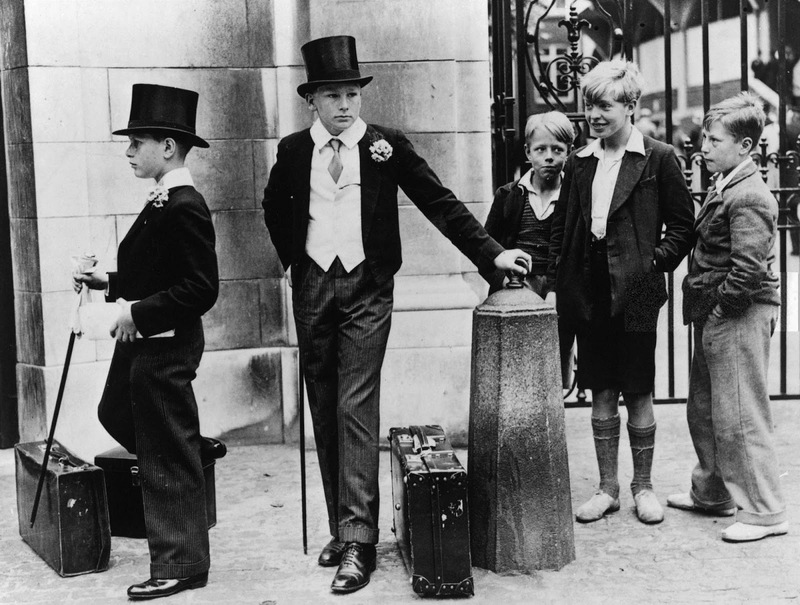 “Toffs and Toughs” is a 1937 photograph of five boys: two dressed in the Harrow School uniform including waistcoat, top hat, boutonnière, and cane; and three nearby wearing the plain clothes of pre-war working class youths. The picture was taken by Jimmy Sime on 9 July 1937 outside the Grace Gates at Lord’s Cricket Ground during the Eton vs Harrow cricket match. It has been reproduced frequently as an illustration of the British class system. The Harrovians were Peter Wagner and Thomas “Tim” Dyson, who had arranged to be at Grace Gates at 2 pm, where Wagner’s father would pick them up and drive them to Russ Hill, the Wagners’ country home in Surrey, for the weekend. The other three boys were George Salmon, Jack Catlin, and George Young, 13-year-old pupils at the local Church of England primary school. All three had been to the dentist that morning and then decided to skip school and hang around instead outside Lord’s, where the Eton-Harrow match offered money-making opportunities to any boy willing to open taxi doors and carry bags, or to return seat cushions to their hirers and claim the three penny deposit. The News Chronicle published the picture the next day on the front page, under the headline “Every picture tells a story”. A one-line caption identified only the event and location. According to Peter Wagner’s sister, when the Wagner family first saw it, “we probably laughed because they [the boys] both looked so fed up”. But in the years that followed, her amusement faded. Later she declared that the picture was known “for all the wrong reasons”. Tim Dyson (the rich boy staring toward the camera) has the saddest story of them. A year after Sime took his picture, his parents arranged for their son to join them for his summer holidays at their army quarters in Trimulgherry, India. Dyson began to feel very ill while traveling and was diagnose with diphtheria. Tim died in Trimulgherry on 26 August 1938, aged 16. His father was captured by the Japanese at the fall of Singapore and died in a Korean prison camp on 22 November 1942, four years after he buried his only child. Peter Wagner entered the family stockbroking firm, married, and had three daughters; he became mentally unstable in the 1970s and died in Hellingly Hospital in 1984, aged 60. George Young and George Salmon were each married when interviewed for the Daily Mail in 1998. Young started a window-cleaning business and set up his four sons in the same trade. Salmon, who still lived in Marylebone, died in 2000. Jack Catlin‘s family moved to Rickmansworth soon after 1937; he was widowed, remarried and living in Weymouth in 2010. In striking contrast to Wagner and Dyson, all three men had reached old age and a plateau of contentment. But Catlin hadn’t maintained contact with Salmon and Young. His wife said that when a newspaper (perhaps the Daily Mail) had asked the three men to get together to reconstruct the picture at Lord’s, or at least their part in it, Jack had refused. Probably to be stereotyped as a poor London boy – a tough even – may have irritated a man who had made good and probably felt no nostalgia for the pre-war streets of his childhood. Toff is a British slang meaning a wealthy, upper-class person. Its origin is perhaps a variant of tuft, a nickname for a titled student at Oxford University, wearing a cap with a gold tassel. The Eton vs Harrow cricket match is one of the longest-running annual sporting fixtures in the world. The match declined as a social occasion in the years after the war. There is nothing inherently "evil" in class division. The poor claim contempt for the upper classes but had they been given the chance to be in the others' shoes they would not pass it up! Elite does not equal unhappiness nor greed. The elites considered themselves altruistic, well-mannered, and hygienic. People will do many things to be loved, but they will most all things to be envied. I bet the 3 kids on the right could beat the crap out of the two on the left. Flatten their top hats, eat their lunches, smoothing their stuffed shirts quite a bit. That is the biggest misconception ever...we cannot say who truly is stronger just because of how they are dressed....we do not know what sort of strength is under the clothes these children wear. Judge not, lest ye be judged. The reason that the working classes acquired a bad reputation was because of their violence and dirtiness; NOT their lack of money. In making remarks like the one above, you are perpetuating that view. Summer Vacation in an army barracks in India? Father captured by the Japs. Bets this toffs did some harsh things to some of those brown kids while summer vacationing, but nobody says nothing about that huh? I've always been bemused by the portrayal of this photo as upper class vs. working class lads. The "working class" lads are wearing jackets with pocket squares and attend a C of E school, a system generally known as quite good. If you look at the photo without the lads on the left, the 3 on the right look quite dapper without the stark comparison to formal dress. By today's standards, the boys on the right would be the best dressed at any school. Update - Per Wikipedia, the middle boy on the right, "Jack Catlin died in January of 2011 at the age of 85, survived by his wife Shelia, his son, daughter, and grandchildren."